Andrew Scheer was elected leader of the Conservative Party of Canada today, (hopefully!) putting him on course to become the next prime minister. His proposed gun policy is reproduced below. In my mind, a successful firearms policy should do two things. It should deter criminal activity and should respect the rights of law-abiding gun owners. For too long, laws in this country have had it backwards. Bills crafted in downtown offices by people who often had no first-hand experience using firearms have put undue restrictions on those who respect and follow the law while doing virtually nothing to stop the criminals who ignore it. I’ll never forget the first time I went hunting. I went with a group of friends up to Northern Saskatchewan for whitetail deer. The first thing that struck me was how safety-oriented everyone was. I must have been told a dozen times how to handle my rifle safely. I quickly realized that gun owners are sticklers for safety because they are the ones affected if something goes wrong. The people I was with knew and followed all the rules, whether it was safe transport or minimum distances from dwellings, because they knew and took seriously the responsibilities that go along with firearm ownerships. I won’t go into all the details about the trip (except to say that I dropped a buck from 400 metres away using a friend’s .308 precision rifle! And the jerky tasted terrific). It is abundantly clear to me that there are several things that need to change in order for us to have a more balanced, effective firearms system in Canada. Launch a review of the criminal code and repeal all federal regulations pertaining to firearms ownership, usage and transportation which do not do the following: ensure that Canada’s firearms laws respect the rights of honest firearms owners, recognize the fact that hunting and sports shooting are an important part of Canadian culture and history, and empower police to concentrate on real criminals who are a threat to the public. Remove the power of the RCMP to arbitrarily make reclassifications. Too often, certain types of firearms are reclassified and made illegal simply because of how they look, and not because of any safety concerns. I will enact legislation that removes the subjective authority of the RCMP to reclassify based on aesthetics. The legislation that my government will enact will specify actual legal definitions for variants to ensure that those unfamiliar with firearms cannot decide on the legality of a gun based on how it looks. They will instead be required to make determinations based on the actual mechanics of firearms. Like firearms classifications, magazines are also subject to arbitrary rule changes from RCMP bureaucrats. Many of the rules are not based on common sense. I will replace these rules with a system based on advice and input from firearms associations. The Liberals are threatening to submit to the UN markings protocol. This will have a devastating effect on the Canadian firearms market and impose new and undue burdens on law-abiding firearms owners. As well, according to law-enforcement experts, there is zero evidence that it will have any positive effect on fighting criminals. I will repeal these regulations and ensure that they do not come into force. I will ensure that this group of firearms experts has meaningful input on government policy decisions. I will also ensure that the members of the council include representatives from the stakeholder groups who would be affected by those decisions. Decriminalize administrative infractions such as late renewal of a recently-expired firearms licence. As the regulations currently stand, a person becomes a criminal for allowing their licence to expire. That is a complete waste of government and police resources. I will institute a grace period for lapsed five-year permits, wherein you won’t be able to purchase anything new, but you will not be subject to criminal prosecution or face the possibility of a jail sentence. In order to ensure that any new Government proposals and initiatives are always seen through the lens of honest firearms owners, I will create an Ombudsman to advocate on behalf of the firearms community. This person will have the authority to review any proposed regulation and interact with the Public Safety Minister on behalf of individual firearms owners and the various firearms organizations. 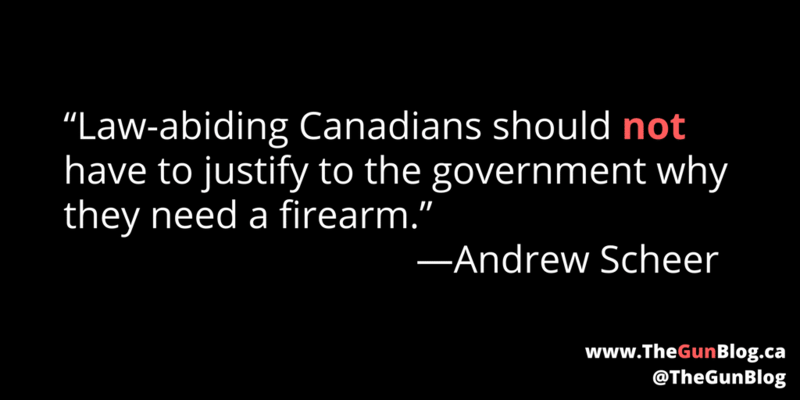 Law-abiding Canadians should not have to justify to the government why they need a firearm. You can be assured that I will always be on the side of law-abiding gun owners. No drug dealer has ever stopped to get an ATT before he went about committing his crimes. We need laws that will empower police in their efforts to keep our streets safe. The policy I am proposing will ensure that law enforcement officers aren’t forced to waste their time policing those who follow the laws, and can concentrate their efforts on actual criminal activity with regards to guns. I have worked to fight ridiculous and wasteful laws since being first elected in 2004. I am proud to have the endorsement of former Conservative MP Garry Breitkreuz, who famously exposed the waste in the long-gun registry and who worked tirelessly to scrap it.